Blake Shelton is in the Christmas spirit. 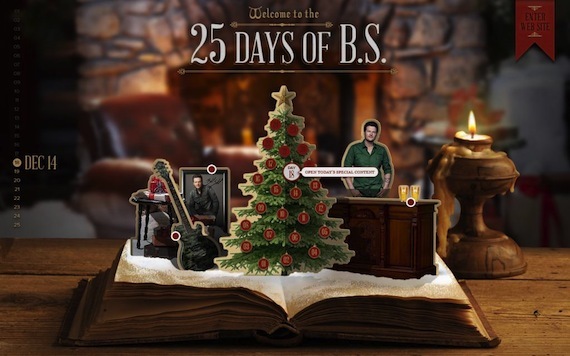 He’s sharing messages, giveaways and more at 25DaysOfBS.com until December 21. He’s busy promoting his first holiday album, Cheers, It’s Christmas, and will perform and interview with Jay Leno Wednesday (11/28) on The Tonight Show, followed by a Thursday night (11/29) visit to Chelsea Lately on E!. Blake Shelton’s Not So Family Christmas television special on NBC airs Monday, December 3 after The Voice at 10 pm EST/PST. The Christmas album includes duets with Michael Bublé, Reba, his mother Dorothy Shackleford, wife Miranda Lambert, Kelly Clarkson, The Voice semi-finalist Xenia and The Pistol Annies. Many of the same guests also joined him for the television special. CMT Invitation Only: Blake Shelton will be released to DVD December 18 exclusively at Target. He’ll also perform an acoustic concert December 8 in Los Angeles as part of the jcpenney Holiday Giving Tour.